How exactly do you pronounce Yossarian? This was my big concern Thursday night, in the moments before I stepped to the lectern to read five minutes’ worth of Catch-22. 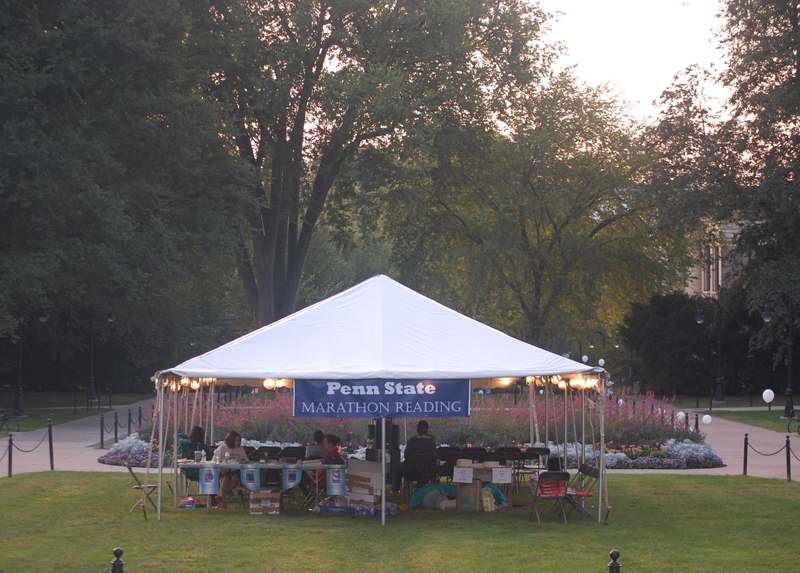 I was one of hundreds of people taking my turn in a marathon public reading of the classic novel, which Joseph Heller started writing while he taught at Penn State in the early 1950s. The event kicked off at 1 p.m. Thursday—Sue Paterno ’62 opened the reading—and was scheduled to end sometime Friday afternoon. …and Friday morning at 7. I signed up for two spots, the first at 10:05 Thursday night. There were maybe 20 people there, including three students in pajamas who had sleeping bags already set up on the grass. I checked in with Cindy Lee, a sophomore who serves as treasurer of Unabridged, the student organization for English majors. I waited a few minutes and took my turn, reading through the section of chapter 22 in which Milo Minderbinder explains “the syndicate” to Yossarian. I forgot how much fun this book is. I was back Friday morning at 7. There were about a dozen people there, including a woman reading with her dog standing attentively behind her, and a couple of students (not the ones from the night before, as far as I could tell) still dozing in sleeping bags. There, too, was Cindy, who hadn’t left since 6 p.m. Thursday. In addition to manning the sign-in desk, she said she handled about “an hour and a half, maybe two hours” of reading during the sparsely attended overnight shift, when the audience dwindled to as few as four. 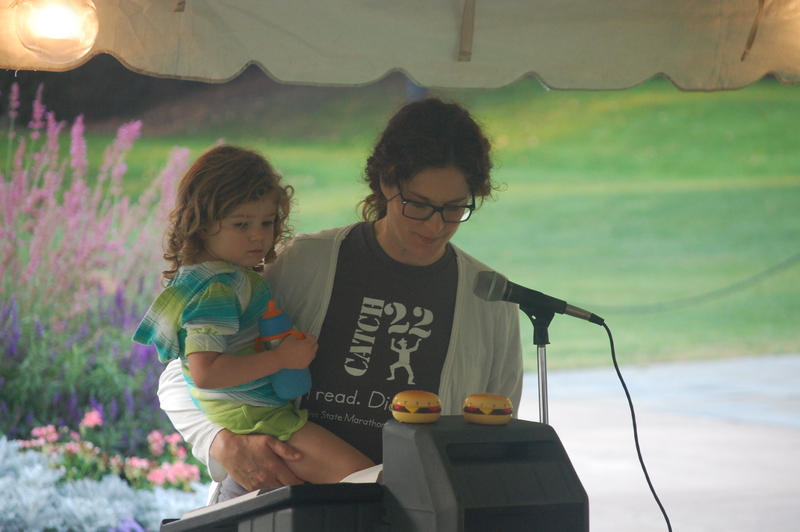 I read the last couple pages of chapter 28, and was followed by English professor Debra Hawhee ’00g, who read with her 2 1/2-year-old daughter Nora in her arms. The reading continued as I headed home to get ready for work. There’s talk of this being an annual thing. I hope so. Oh, and it’s yo-SAIR-ian, not yo-SORRY-an. Either way, a classic. Entry filed under: University Park. Tags: Catch-22, Cindy Lee, Joseph Heller. I had the same question as I listened to the first three readers on Thursday (before heading back to work). That’s how it was pronounced in the film of Catch 22, and the way Heller said it when I heard him on Johnny Carson (great interviewer) and David Letterman (awful interviewer). Despite the minor caveat, compliments to all the readers and to the organizers. 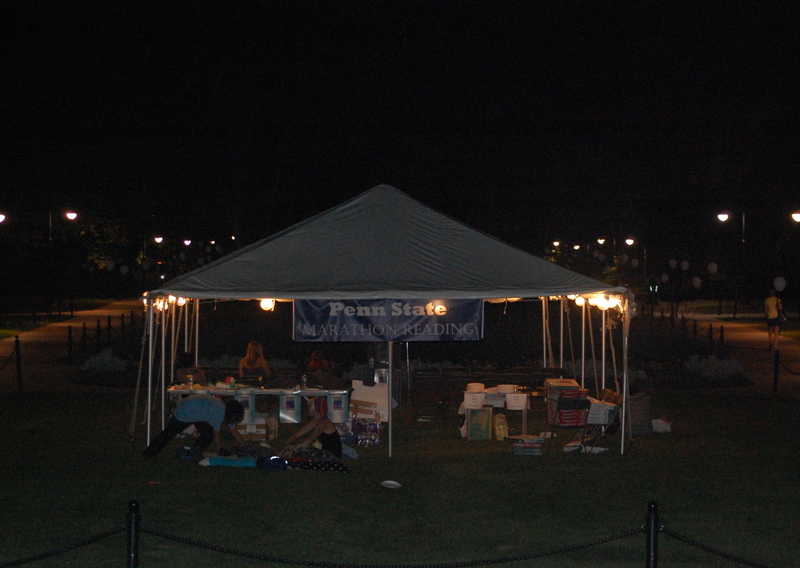 A brilliant way to showcase Penn State’s scholarship and support by and for athletics.